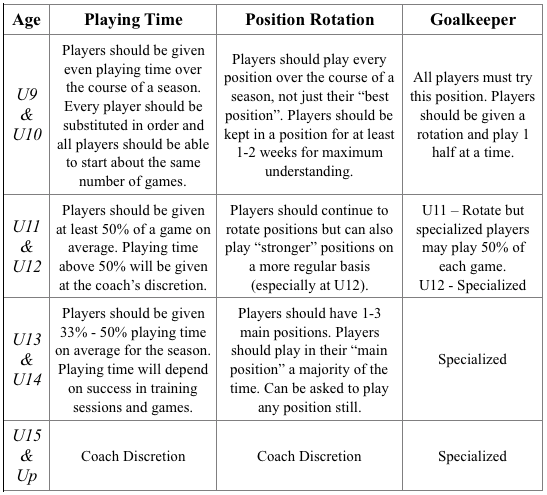 While curriculums can vary at different clubs, levels of play and cultures, one thing remains constant; a belief that a long-term development plan is crucial to a player’s, team’s and club’s success. 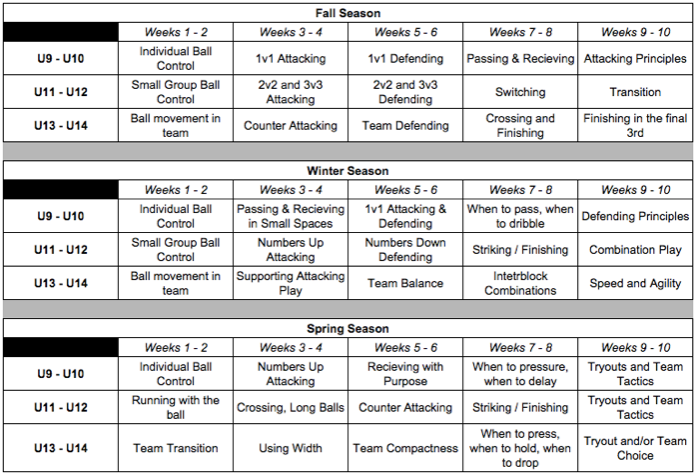 All curriculums have a foundation in the 4 pillars of soccer – technical, tactical, physical, mental - all look to create the first building block of technical proficiency and progressing from there. At the WSA, we understand that coaches come from different backgrounds and therefore will all impose their own style on training sessions and games. We look to embrace those differences underneath a template of topics to be covered at the proper developmental ages and stages. * An important note that these topics are very broad, intentionally so. Different teams within the travel program have different needs and coaches may look to spend more or less time on certain topics based on the foundations required. These policies are meant for travel teams only within the WSA club. * Exceptions to the playing time policy would be for players not showing up for practice or games for reasons other than illness, school conflicts, religious observance or family emergencies. Being perennially late for practices/games (“late” being any time after the assigned time for beginning pre-game warm-ups); skipping tournaments; any attitude or discipline problems may result in a reduction in playing time. In the event that a league or tournament games are missed without one of the justifications described above, a coach is permitted not to play a player for up to ½ game for each game missed. In these circumstances, the coach should communicate the reasons for reduced playing time to the player and his or her parents. * Players ARE NOT penalized for other activities conflicting with PRACTICES ONLY in the spring seasons.